This online museum displays the work of first-year Mercer University students who have researched the issues involved with the Civil Rights Movement in Macon, have transcribed oral histories with people who were involved in the movement, and have produced exhibits about key episodes in the movement. In 1963, Mercer University became the first college in Georgia to integrate voluntarily. 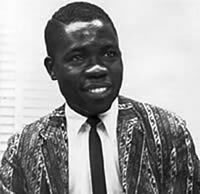 This exhibit tells the remarkable story of Sam Oni, Mercer's administration, Mercer students, and the legacy of segregation at a private Southern Baptist university. During the Civil Rights Movement, southern churches wrestled with the thorny problems of Christian theology, non-violent direct action, and southern tradition. 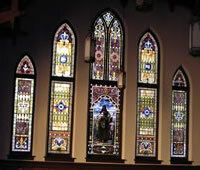 This exhibit examines the responses of four churches to integration. The Supreme Court ordered in the 1954 Brown v. Board of Education decision that schools should be integrated with "all deliberate speed." In Bibb County, desegregation took sixteen years. This exhibit tells the story of school segregation and desegregation in Macon. The movement in Macon was mostly peaceful, but there were some tense moments and some important leaders who resolved the tension. This exhibit describes black activism, white resistance, and Baconsfield Park.